The stock market keeps edging higher this year, but we've zoomed in on one stock that just flashed a lucrative "golden cross" indicator. That could mean a potential 150% gain for investors who know how to play it. You're going to know just how to do it too. 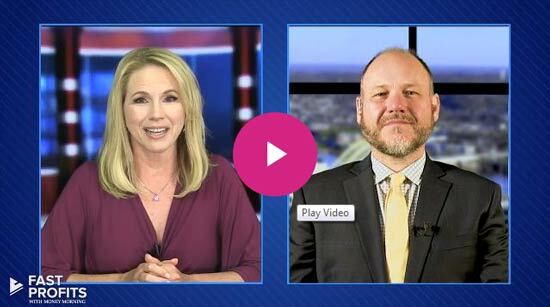 Money Morning Quantitative Specialist Chris Johnson sees the S&P 500's move above the 2,800 level as being quite positive. Since October, this price level, give or take a few points, stopped at least four rally attempts. But as they say, the stronger the resistance, the stronger the market will be when it finally punches through. And it punched through last week. The rally that began in December of last year still has room to run higher, even with the small pullbacks that are inevitable along the way. That's creating new opportunities for bullish trades, and we've uncovered one biotech stock that could shoot higher during this rally. Chris Johnson is a quantitative analyst, which means he looks at data generated by the market, runs it through his proprietary algorithms, and then trades based on the unemotional results. His analysis led him to the biotech sector, where he pinpointed a stock with the potential to break out even higher to the upside. The stock he found is Epizyme Inc. (NASDAQ: EPZM). The company is in biopharmaceuticals and is working on medicines that target various cancers, especially non-Hodgkin's lymphoma. The stock has a market capitalization of $957 million, which puts it right in the middle of the small-cap sector. Despite its rather choppy movement over the past month, technical indicators called moving averages show bullish signs. 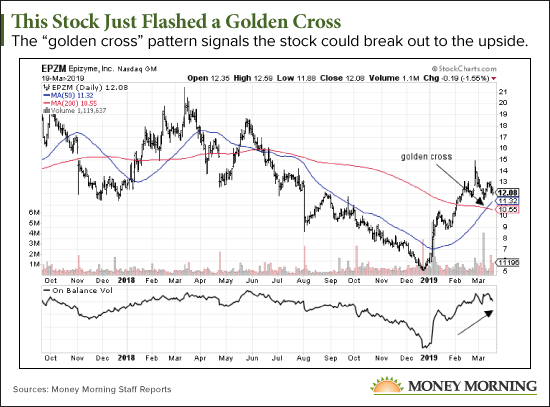 Johnson noted that the stock recently formed a "golden cross," which suggests that the major trend has turned to the upside. Specifically, a golden cross occurs when the 50-day average moves above the 200-day average. Put another way, the 50-day average, which is more sensitive to market movements, crosses above the 200-day average – a sign the stock price is moving quickly higher. This can only happen after a sustained advance and, more often than not, a breakout through trendlines drawn on the chart. The opposite occurs when the short average drops below the long average. This is called a "black cross" or "death cross." As you can tell from the names, it is not good for investors. Not all golden crosses result in a big move higher in the stock price, but no major rally can happen without one. For a stock that was trending lower, as Epizyme did for most of 2018, it really is the light at the end of the tunnel. The chart patterns tell us which way the trend is pointing and how strong it is. In this way, we combine quantitative signals with technical signals for a one-two punch and much higher odds of success. But aside from moving averages, we can also measure how aggressive bulls and bears are when they buy and sell. Although we cannot ask every investor how they feel about the stock, we can look for the signs they leave behind thanks to their activity. For example, if bulls are more aggressive and feeling feisty, we see more activity taking place at the stock's ask price than at its bid price. In other words, bulls want the stock, and they are willing to pay up for the privilege of owning it. If we add up all the shares that traded during the day when the price ticked higher from the previous trade and subtract all the shares that traded when the price ticked lower, the result will be a good proxy for supply and demand. When more shares change hand as the price moves higher, it is bullish. And that is what we see in Epizyme over the past month, even though price action was choppy. This indicator is called on-balance or cumulative volume, and it tells us that bulls are more aggressive than bears and money is flowing into the stock. The more signals we can piece together, the better our overall forecast will be. Johnson sees the stock reaching $15 per share in the near term for a $3.02 gain per share. A $3 gain may not seem like much, but for a stock trading at $11.98, that represents a 25% profit. But you can amplify these gains by using options.